We have Feijoa trees, apple trees, banana trees,orange and manderine trees,guava trees, macadamia trees, and all sorts of other trees. 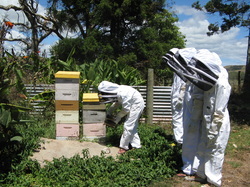 We use beeswax for kawakawa balm and chickweed balm. 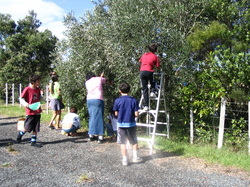 We have our own olive trees and we also pick olives from the district. The olives are pressed into oil and then bottled. Labels are designed and made by the students and then the oil is marketed. 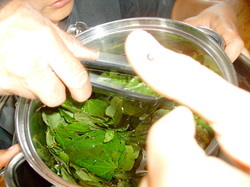 We make ointment with kawakawa leaves that helps your skin feel and smell good. We grow the kawakawa at school. We make our own olive oil and use lavender from our gardens for scent. We get the beeswax from our own hives.